That's honestly a great price for two years for a starter, especially with the silliness lately involving safeties. He should be fully healthy, has a few more years in him, has produced in the past, fills a need, and can be cut after a year or scrapped for a late compensatory pick if he stays healthy and produces. To your point on me saying Baker's anticipation was lacking you're missing nuance there... Nuance is always missed on this forum .... I repeatedly made the point that, "Baker's anticipation throws under pressure and specifically inside pressure.." were lacking Comparatively based on the game film over the course of Baker and Sam's careers. 3.) Is it possible to have liked Baker Mayfield enough to have him as a special player 11th overall on one's big board, but still like another QB a lot more as the clear number 1 (Darnold)? (Hint: Yes imo). I did make the point that his anticipatory throws on the move outside the pocket were special. 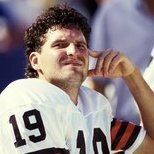 Furthermore, I had Baker as the 11th best player in the draft, said he'd make multiple pro-bowls throughout his career, said he'd be "the best QB year 1," said Darnold would be the best by year 3, said the difference between Darnold and Baker was HOF-QB in the case of Darnold and multiple pro-bowl franchise QB on the part of Darnold, and I ultimately wanted Darnold. Don't mix up my trolling for Sam and against Baker b/c I knew Baker was the pick long before everyone else as me thinking Baker wasn't a great prospect. Even still, when I did a quantitative analysis of the QBs and posted it the January before the draft Baker was ahead of the pack in terms of the Raw Score on all the indices of Quarterbacking value I used. However, when weighting certain dimensions of QBing more so than others, then taking a few points off Baker for what I perceived were issues responding pressure, as well as immaturity issues, then projecting Darnold's evolution over a 3-year time course, the clear choice for me was Darnold. Also, remember this post when we look back halfway through the season and see that Peppers isn't even clearly better than Burnett. Book it. The Peppers hate is strong. He’s a good player and will be a top 5-10 SS in no time. It was a big loss, but we will be fine. I could see a scenario where PFF and numbers wise Burnett looks better especially given the defensive talent around and in front of him. He'll be asked to do little but do it well. Jabrill is going to be asked to do everything and is playing with poor talent around him. Jabrill outplayed his PFF numbers by a wide margin this year b/c he did so much dirty work. So many games he sacrificed his body on the edge to seal a run fit forcing the ball carrier back into the interior or help. He had a ton of hidden production like that. It absolutely won't be the case that Burnett will be better than Jabrill as a Player at the end of the year imo as at this point in Burnett's career he and Peppers are in an entire different class of SS quality play. I'm not quite sure why so many think Peppers played poorly. He played really well despite some issues at times. I couldn't agree with all of this more. The hate doesn't make much sense. He embraced playing out of position year 1 and took accountability for his mistakes even though it was a tough tough job. Year 2 he was our defensive garbage man ... tasked with all the grimey and dirty work in the run game and intermediate pass coverage. He had hidden production in every game and played really well. Yeah, gotta admit kinda hoping for a deep angel kinda deal in NYG for teh lulz. Dr. Jabrill is a good safety overall, but not seeing what you and @BleedTheClock are pinesing over. Even the garbage man discussion above does not sound like it is describing a strong safety with a ton of resource value more than a high third rounder or so. There are a few safeties in the second round who look like they could be better by this time next year than Peppers, but of course it's all projection at this point. Edit: and this is just a gut thing, but for some reason Tayne cannot shake the feel that Peppers's body will not hold up for very long. When he lays a big hit, it doesn't look like he has that oomph behind it to do it very long, like he's supposed to be a free safety but just isn't a difference-maker in coverage so defaults to more the strong (generally less valuable in today's game). I’m a founding member of the Peppers can club, dude can play when used correctly. That said, Burnett will be fine. if it's between college prospects Jabrill Peppers, Jonathan Abram, Taylor Rapp, LaDarius Wiley, Darnell Savage ... I'm taking Peppers every single time as the more quality overall player. He's the most fluid and dynamic football task athlete out of the group. His willingness to throw his body in harms way even when indirectly effecting a play is tops in the group. In terms of covering TEs and Slot WRs, he is just below Savage. In terms of run support player instincts wise, he's second only to Taylor Rapp. In terms of big impact hits and plays, he's behind Jonathan Abram at the top. In terms of the ability to play Box/Nickel-LB, he's at the top of the class. In terms of General pass disruption, he's probably 3rd or so. Still, overall he's clearly better than those guys imo. Burnett over the last two years has been plagued by hamstring, lower body injuries... he might not be a reliable and available player over the course of the season meaning it is still a major priority to find our starting SS in the draft. He wouldn't have got anything close to 4 million guaranteed if this Safety market wasn't so insane money-wise. I’m betting on that he look pretty decent running the fun and gun, that he should look good running some air raid with Monken. Gilbert looked good at SMU being able to air it out. His time with the Panthers and Raiders were focused on the more traditional offense schemes or very heavy run based. I think if he catches on, it will be in this kind of system. But seriously in terms of usage in 2017 he was used often as a single-high "angel" type of catch-all Safety that had to read cues and range play-make at all various levels of the field. When he wasn't doing that, he was used as a box support player. THis year in 2018 he was used more in line with his physical talents (as a box LB/S with range pass disruption ability). Even still, although he didn't have many opportunities to make plays in the game you refer to (Kansas St.) and it wasn't his best game (not even in top 7 of his games between 2017-2018), if I were you I'd go back and watch that game again as in my notes he had multiple run fits, set the edge making plays in run support, coming up from the deep safety position with a perfect tackling angle to stop a run before it got loose, well-timed quick blitz, and a few range pass disruptions on the boundary including one where he dropped the interception for the PD. I personally don't think one game or one play scouting provides much of anything in terms of diagnostic information, but if you must watch only one game it's best imo to not watch ball production, but instead watch how the player moves, cues in on things, assess their instincts. Maybe he'll be a JAG, but I don't think 1 actually solid game would tell one that. Well, hey. Didn't mean to pee in your cheerios here. Didn't know you were championing him. I just read through posts and if a name pops up that I'm not overly familiar with, I head to the YouTubes and stretch my eyeballs. Kansas State was the first game that popped-up (didn't realize it was from 2017), so I watched it and came away with the impressions as stated above. But you see...the funny thing...I literally said "Maybe I'm missing something..." which to the general population means I'm open to new information before passing final judgment. I've read your posts, probably thousands of them over the years, and you seem to have a depth and analysis that is at least well-constructed and reasoned. So if you want to treat fellow forum posters like they're neophytes in the game of football and have never scouted a player before, you go ahead and do so. I tend to believe taking that sort of tone discourages others from contributing to a discussion (Well, not me, I'm far too dense). But I did like the parts about his change in assignments from 2017 to 2018, that was useful information. Yeah, Peppers was good for us. I thought it was laughable that some fans were calling him a bust after one year when he was clearly playing out of position. Peppers looks like he'll be one of the better strong safeties in the league. He's great at playing in the box and is respectable in coverage. Fortunately, I think SS is one of those positions where your team will be fine as long as they just have decent SS play. Burnett is a downgrade for sure, but he should be suitable for a year or two.